ClearMed Solutions helps organize and manage multiple medications, giving you or a loved one peace of mind after a major medical procedure. At Heartland Pharmacy, we want to do anything we can to help make our customer’s lives easier. One common problem our new customers face is organizing and managing their multiple medications. Whether you are caring for an elderly parent, a grandparent, a sick spouse or a loved one after a major medical procedure, ClearMed Solutions can give you that peace of mind. Each ClearMed box organizes all of your prescriptions into one roll of pouches that reduces the possibility of missing a dose. Each pouch contains the time and date, the medication, and a description of the pill. Budget your money more effectively and plan appropriately knowing that your medication is delivered at the same time every month. Avoid feeling tight on time. Let Heartland manage your medications so you can manage your life and time with what matters most. Don’t depend on anyone to pick up or understand your medications. We manage and organize your medications before they leave the pharmacy. No more taking multiple trips to the pharmacy or keeping up with medications. Your prescription is delivered to your door, customized for your daily schedule. After signing up for ClearMed, the pharmacist will review all medication history from the hospital to help ensure proper medication therapy. At discharge, the patient will have a patient manager assigned. This patient manager works closely with the patient to ensure all medications are being taken correctly. 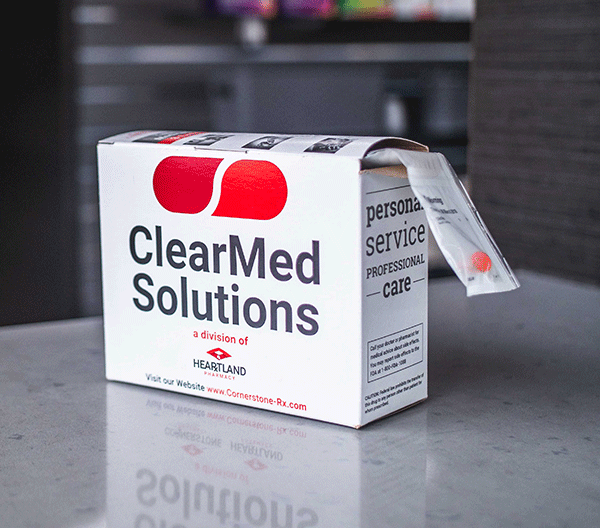 ClearMed offers safe and convenient filling methods. Opt to have medications filled and delivered to the patient’s home or facility, or the patient may have the option to pick up. Throughout our care program, ClearMed patients will receive regular calls from their patient manager offering assistance with medication and therapy management. If interventions are needed, we are here to help facilitate care with a doctor. For as long as the patient is in the ClearMed program, they will continue to receive care and education through their patient manager. If you are interested in joining the Heartland Pharmacy family, please visit our employment page and fill out our form. Copyright © 2019 Heartland Pharmacy | Designed by Agency501.